President Trump spoke Friday at Suffolk County Community College on Long Island, near where the violent street gang MS-13 has committed a number of murders. 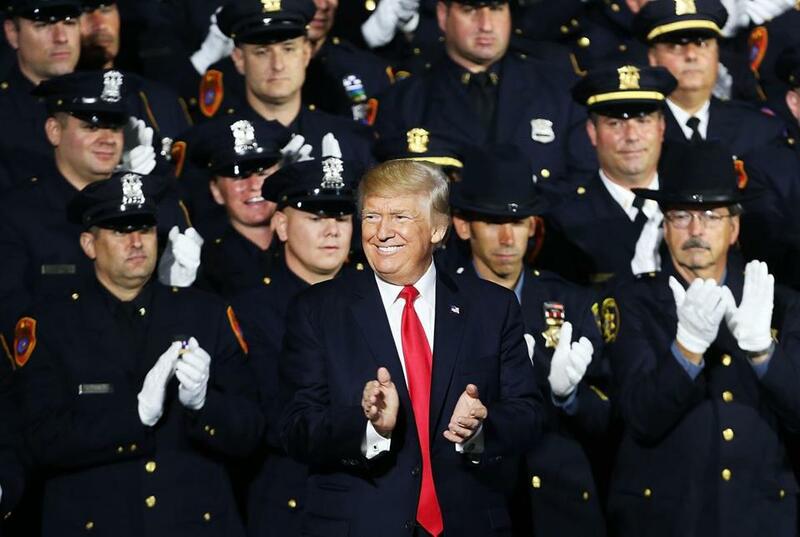 During a speech in Long Island on Friday, President Trump took a break from discussing gang violence and illegal immigration to give the law enforcement officers gathered for his remarks some advice on how to treat suspects. ‘‘When you guys put somebody in the car and you’re protecting their head, you know, the way you put their hand over?’’ Trump said, miming the physical motion of an officer shielding a suspect’s head to keep it from bumping against the squad car. These remarks, coming after Trump talked about towns ravaged by gang violence and described ‘‘these thugs being thrown into the back of a paddy wagon,” were met with applause from at least some of the law enforcement officers gathered for his speech at Suffolk County Community College. A group of uniform officers standing behind Trump applauded and, when he turned to face them, some smiled and appeared to chuckle. The Suffolk County police quickly distanced itself from Trump’s comments, saying Friday that it would not accept this treatment of people in custody. Trump’s remarks also drew a rebuke from the International Association of Chiefs of Police. In a statement, the group did not specifically mention Trump by name but appeared to respond to his speech by stressing the importance of treating all people, including suspects, with respect. ‘‘Managing use of force is one of the most difficult challenges faced by law enforcement agencies,’’ the group said. ‘‘The ability of law enforcement officers to enforce the law, protect the public, and guard their own safety, the safety of innocent bystanders, and even those suspected or apprehended for criminal activity is very challenging. ‘‘For these reasons, law enforcement agencies develop policies and procedures, as well as conduct extensive training, to ensure that any use of force is carefully applied and objectively reasonable considering the situation confronted by the officers,’’ the statement continued. Boston police also distanced themselves from the president’s remarks. Trump’s comments were made during a dark, foreboding address largely focusing on the transnational gang MS-13. He also peppered his comments with expressions of support for police, echoing his efforts both during and since the presidential campaign to portray himself as a champion of law enforcement.